Color(s): Presents in a variety of colors including brown, black, red, tan, and cream. May be solid, brindled, or pied. The Olde English Bulldogge is a recent and contemporary recreation of the Old English Bulldog which is extinct. 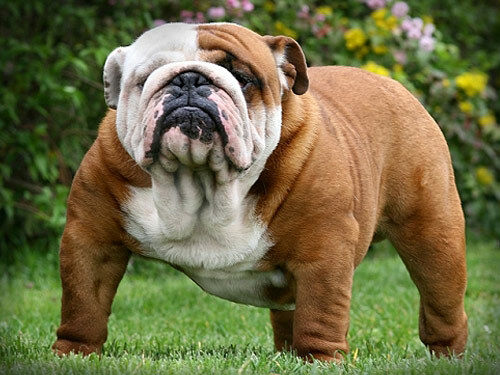 Developed during the 1970s by David Leavitt, this breed was created using an English Bulldog, Bullmastiff, American Bulldog, and Pit Bull. It was Mr. Leavitt's intention to produce an Olde English Bulldogge that was not violent in temperament and free of health problems. A compact, broad, and muscular breed, the Olde English Bulldogge has a well-proportioned body and is medium-sized. They are stout, athletic, powerful, and alert. The Olde English Bulldogge is loyal, trustworthy, and stable. They are docile and friendly but highly capable of protecting their family and property if threatened. This breed is extremely sensitive and bonds closely to their family. Olde English Bulldogge's do well with children, dogs, and other household pets they have been raised with. Occasional brushing is recommended. Bathing should be done when necessary. The Olde English Bulldogge breed has a tendency to drool and slobber so frequent cleaning of the face is required. They are prone to such health issues as bloat and have a low incidence of hip dysplasia. The coat of the Olde English Bulldogge is short, close-fitting, and fine in texture. Early socialization and obedience is recommended. This breed is intelligent and willing to please. However, they can also be stubborn. They will not respond to harsh or heavy-handed methods. Training must be done with motivation, consistency, fairness, and patience. The Olde English Bulldogge will do well in an apartment provided they are sufficiently exercised and mentally stimulated. If they become bored or lonely they will become destructive. This breed likes to chew, so it is important to provide a safe variety of chew toys. Olde English Bulldogge's thrive on therapy work, agility, and family play.